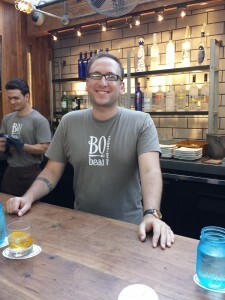 BO-beau kitchen + garden is one of the Cohn Group’s restaurants here in San Diego. “Bohemian-chic meets industrial elegance” is what their website tells you and I’d say that’s a pretty apt description. Open, airy and with an outdoor garden for dinner or drinks , the space is comfortable and pleasant. I checked out the back bar so I’d know what whiskey was available and on a whim decided to sit at the bar. I’m very glad we did! Little did I know that our mixologist for the evening would be Eater.com’s Best Bartender of the Year, Vasilios Karatolis! We started chatting about favorite bourbons and cocktails (in between, while he pouring gallons of wine and beer – the place was reasonably busy). Since I didn’t know (yet) that I was in the capable hands of a master mixologist, I ordered something from the menu – The Doctor’s Orders. Bourbon, Bénédictine and creme de cacao – smooth, a little sweet and overall tasty. But now that we’d exchanged pedigrees (master mixologist meet whiskey writer), my next drink was dealer’s choice – I’ll try anything once, and given Vasili’s expertise, I knew I’d be in for a treat. Everything that is old is new again (but please no leg warmers – they need to stay in the 80s) and egg whites are making their way back into our cocktail glasses. Whiskey sours are traditionally made with them, but you don’t often see that. A whiskey sour, complete with egg white and muddled strawberries?! Yes, please! Perfectly balanced, a little tart, a little sweet, with the egg white adding a bit of silky fullness (and a spot of froth on the top) – very pretty to look at and tasty, too! Now, I did mention it was my birthday, right? So drink #3 was dealer’s choice again (at that point, Vasili said he liked my style!). This time, not only were we going off-menu, but we were going to have something from no menu, ever – completely created by Vasili. He called it the “B&B” – bourbon and beer. 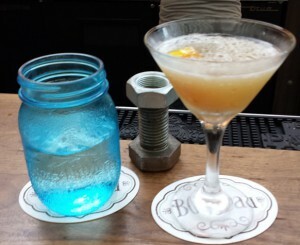 I will confess – it had bourbon, a float of a Belgian white ale on top….some citrus and I think he mentioned a liqueur. But I’m going to blame the sound level of the bar for not remembering exactly the ingredients (it wasn’t really that loud). Right. That’s my story and I’m sticking to it. It was light and refreshing and something that should find its way onto a menu! 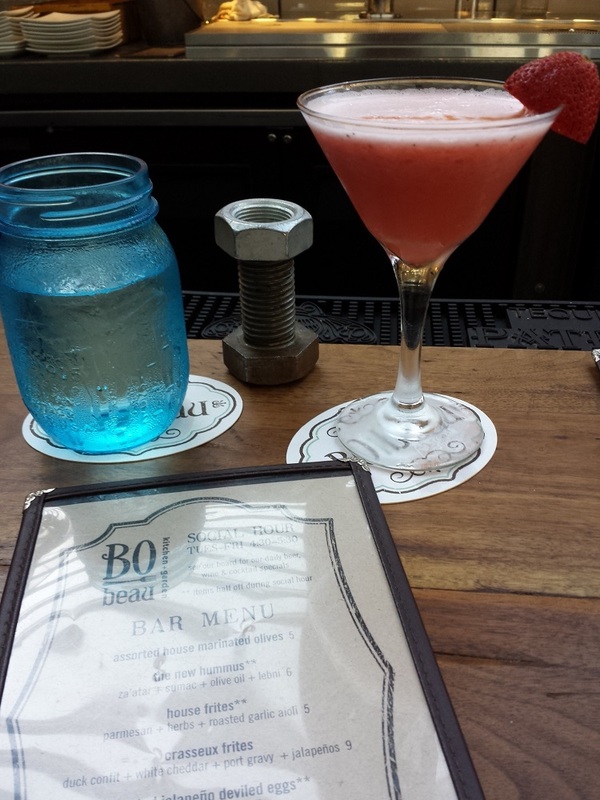 Mixed in between drinks, we did also try some of their food – I’ve not met a Cohn restaurant I didn’t like and BO-beau is no exception. Kat’s Famous Brussels Sprouts? What do you mean they’re a vegetable? I don’t buy it – these lovely, crispy, tart little morsels were perfect. We also tried the roasted jalapeno deviled eggs – fabulous! The next visit needs to include a full meal, and I’m sure it will be yummy as well. The last drink of the evening was a bourbon latte-ish drink. I’d asked for a drink that would bring the bourbon forward (I drink it because I actually like the taste of it!) and I wasn’t disappointed. Some Licor 43 (a Spanish vanilla liqueur), steamed milk and a little fresh nutmeg grated on top – delish! A perfect end to a lovely evening. I also chatted with BO-Beau’s manager, the lovely Katherine Harper – I’m hoping we can put together a local craft liquor pairing dinner at BO-Beau. Stay tuned, San Diegans – it could happen! In the meantime, I’d suggest stopping in – say hi to Vasili, have one of his fabulous drinks and tell him LikeYourLiquor sent you!